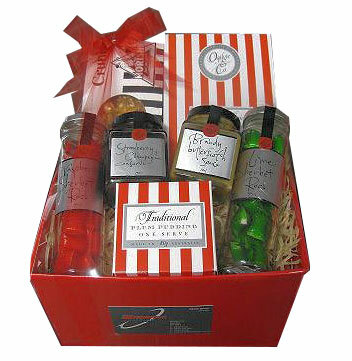 A perfect gift for customers, suppliers or anyone with a savoury tooth. What better way to say it at Christmas than with a Rich Christmas Cake and some Humbugs. For the savoury tooth, Blue Cow Crispbreads partner perfectly the Ogilvie Antipasto Olives and Peppers. Garlic Nibbles and Morish Nuts balance it out. No Bah humbug here! Corporate branding can be added to the presentation.